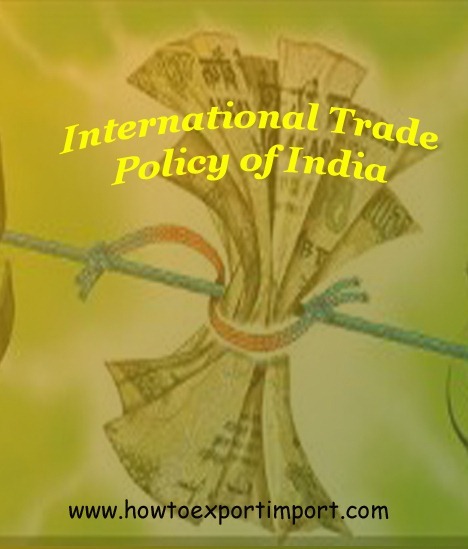 Foreign Trade Policy of India 2015-20 (FTP 2015-20) announced on 01st April 2015 to support manufacturers and service sectors with special emphasis to improve ease of doing business. This five year foreign trade policy introduces new schemes for exporters of India called MEIS, Merchandise Exports from India Scheme and SEIS, Service Exports from India Scheme. 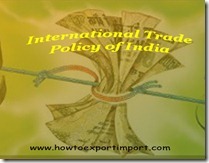 Special focus on trade facilitation also is one of the features of Foreign Trade Policy of India 2015-20. Ajay Khanderia: On 19 April 2015 Any Engineering items exported to Bangladesh under L/C considered under FMS or FPS ? If yes, what are the percentage of incentives ? If no what the the way to get maximum incentives ? pallavi: On 14 May 2015 the article is very much useful for new commers because basic & small small things/ concepts are also include in that . thanking you. Satya Ranjan Sarkar: On 19 July 2015 Dear Sir, I want to be a world wide Importer and Exporter. How i will contact the buyer and seller form a third country without visit their production goods and without known their good will . Now the modern age we can follow the website , or other add , but how we will believe that they are genuine business man? Thanks. Kiran: On 18 August 2015 Hi, May I know the bill discounting limit in post shipment finance for exports finance? Goraksha: On 07 November 2015 Dear Sir, Can I export goods without CHA. Mr.Siddhartha Sil: On 18 November 2015 We Manufacture of stainless steel screw sank nail, we want to contact byer for export. Please guid us. Thanking you. O P Khandelwal: On 14 January 2016 under present exim policy can a jewellery exporter import gold directly for export purposes without going to Govt. approved agencies. Sandip rudani: On 26 April 2016 Dear sir, I want to export drumstick in UAE.can you guide me how can i start and what document is required. Ankur Tripathi : On 09 August 2016 My name is Ankur Tripathi, I am currently pursuing BBA LLB from Symbiosis Law School, Pune and I will graduate in April next year. I have been reading your articles on the site howtoexportimport.com and I am very thankful to you for sharing your valuable experience through this particular website. Sir, I am very much inclined towards a startup in foreign trade via. a partnership. Sir, I have been going though many forums and websites but I will need some guidance from a seasoned person in this field, the reason why I am writing you this e-mail. Sir, I have big goals and I am extremely focused on achieving them through hard work in a right direction. I am doing my part on the topic as a beginner and I discuss them daily with my Senior Advocate with whom I will partner but there are some basic beginner questions which arise in our minds, though anyhow we will be able to get past our hurdles but we will be extremely thankful if you can revert back to us via. e-mail to answer our queries with your valuable experience and knowledge. Rahul Singh : On 12 August 2016 I am Rahul Singh mailing you from Indore (mp). I am 21-year-old and pursuing BBA here from Indore. I have been interest in doing foreign trade since last year. I have planned to start a exim setup and pursue MBA along with foreign trade so that its base becomes strong till i complete my MBA. But there is one doubt that haunts me 1. Is really exporting (merchant trading) a scope full business in terms of money making. Will i be able to earn atleast 25lakhs after 3 years. 2. Other thing is that if all goes well. How much maximum could i earn in an year and HOW?